The Linksys Wireless Video Cameras have a built-in web-based setup page that allows you to customize settings and set up advanced properties. NOTE: Before accessing the camera's web-based setup page, make sure that the Wireless Video Camera is powered and that it’s wired to one of the Ethernet ports on the router (ports 1, 2, 3 or 4). NOTE: To access the Video Camera's web-based setup page using Mac, click here. Open a web browser such as Internet Explorer. Enter "192.168.1.115" on the Address Bar then press [Enter]. NOTE: If the IP address of the Video Camera has been changed, type the video camera’s IP address in the Address bar instead. NOTE: If you forgot the video camera’s IP address, you can press the Reset button underneath the antenna for 30 seconds. This procedure will reset the camera to factory defaults. The Wireless Video Camera’s IP address will revert back to 192.168.1.115 and the user name and password will go back to the default “admin” after resetting. For WVC54GCA and WVC80N cameras, you can either run the Setup Wizard or launch the Linksys Camera Utility to find out the IP address of your camera. A new window will prompt for a User name and Password. 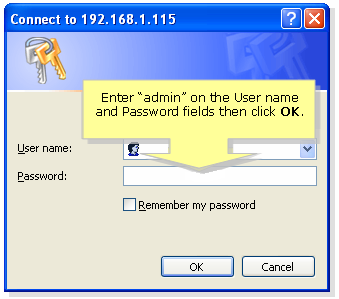 Enter “admin” on the User name and Password fields then click OK. NOTE: If the password of the camera has been changed, type the Wireless Video Camera’s new password in the Password field instead. The Wireless Video Camera’s password can be changed by changing it on its web-based setup page.